This recipe's a total no-brainer. You basically just toss together a bunch of ingredients and bake them. Directions: Preheat oven to 350°F. Line a 11" x 17" baking tray with aluminium foil (for easy cleanup). Spread the peanuts onto the tray in a single, even layer and toast in the oven for 15-20 minutes until light golden brown. (Nuts burn easily, so be sure to check them for doneness at regular intervals.) Remove tray from oven and let cool for at least 10 minutes. While nuts are cooking, mix together all dry ingredients, minus the nuts of course, (which'd be hard to do anyway since they're baking in the oven - LOL! ), and pulse until finely ground. Transfer dry ingredients to an electric mixer (or large mixing bowl). Pour in all wet ingredients and mix on low speed (or fold in with a spatula). Combine just until dry ingredients have become moist. Turn off mixer. Next, add peanuts and gently mix together, being very careful not to press down on them too hard. (You don't want to mash them into oblivion. ;) ) Set aside. Using a sturdy rubber (or silicone) spatula, scoop out the spread peanut butter mixture from the mixing bowl and spread it onto the baking tray, to a 3/4" thickness, pressing down to evenly distribute it across the tray. Bake for 15-20 minutes, or until firm and golden brown. 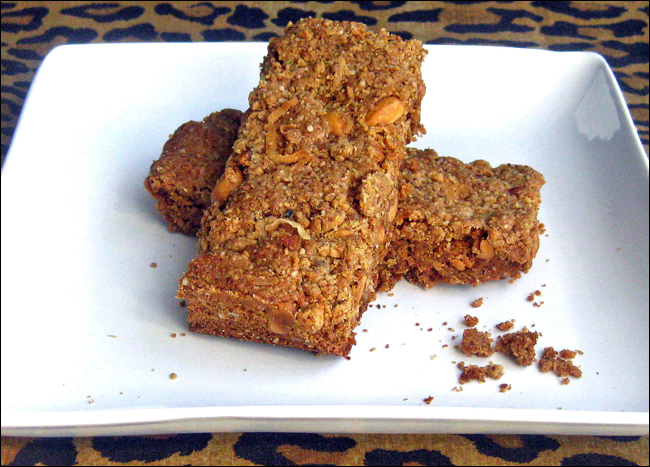 Watch oven carefully to make sure bars do not become brittle and overly dry, &/or burned. When ready, remove from oven and place onto a wire cooling rack or heat-proof trivet. Let cool for at least 5 minutes before dividing into bars, but don't wait too long either, or they'll be more difficult to cut into. ;) So, be sure to cut into them while they're still warm. Divide into 24 rectangular bars, 2"x 4 1/4" each. Any bars you won't be consuming right away can be wrapped in wax paper and then placed into a tightly sealed plastic container or reinforced, resealable Ziploc/plastic bags for on-the-go snacking; just make sure they're completely cool before wrapping them in wax paper. ;) (Or, alternatively, wrap in wax paper, place into plastic freezer bags and freeze. These bars freeze exceptionally well.) Serve & enjoy! Yield: Makes 24 rectangular, 1 1/2"x 4" bars. Chef's Notes: To make this recipe vegan, just substitute nonfat dry soy milk powder for the nonfat dry milk powder. Also, there's no need to freak out about the use of coconut oil. ;) Coconut oil, when consumed in moderate amounts, is actually one of the few healthy saturated fats that actually helps to create/burn energy within the body, as opposed to most (animal-based) saturated fats, which have minimal health benefits & just end up sticking to your rear end. ;) It's not uncommon for athletes to ingest small amounts of coconut oil to naturally enhance their energy during workouts. When used in moderation, it's also been shown to be beneficial as a weight loss aid as well.